There are a range of new services that are various flavours of documentary being delivered in relevant location, as experiential POV events. 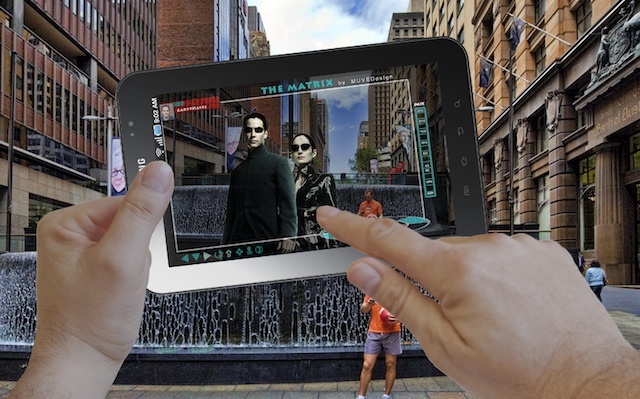 The ability to recreate historical events, see the world as it was and live temporarily in the past is now becoming a major force in AR falling somewhere between my Intertainment and Experiential Education models from my 16 Business Models post of 2009. Creating dramatic, emotional and experiential factual stories in this way is the core of transmedia, as carefully placed stories across time, place and platform. I won’t be going into the technologies that deliver these (like Layar, FlashAR or Junaio etc:) or the devices (from smartphones, bespoke handheld devices, glasses, large shared touch-screens all combined with other platforms) but focus on some of the first round implementations made by companies using these relatively crude tools and imagine a very near term future. As a producer it is always a challenge when on location to bring the essence of ‘that place’ and what it means through your transmedia offering. I produced a pilot while at the BBC (with Mickey McGowan who made the educational documentary series A State Apart ) a connected, interactive journey through the Troubles. It’s transmedia pedigree was as a social connected website between schools and the Broadband connected CD Rom elements allowed extended personal story-lines (a small sample is still up) which were newly sourced to act as extended narrative threads from the 6 part documentary. As part of my asset collection work I travelled to various places such as Belfast, border towns and Derry, met and interviewed people on both sides and went to key locations. One particularly that stuck with me was the Bloody Sunday environments in Derry – the infamous march route in Bogside and the Cemetery where the graves of the 14 shot dead by the British Government in 1972 still remind us of that event nearly 40 years ago. Although I was taking hundreds of images and video, the feeling of standing there, almost hearing the marchers shouting, gunshots, screams was overwhelming. Ten plus years ago the only tools I had at my disposal was sound based Quick Time panorama, bringing place as exploration out of its environment to peoples screens – one key thing was missing – being there! Today I consider, when creating experiences (drama or doco), the possibility of allowing those who are at the place to immerse themselves via AR, using it as a metaphorical time machine, they can replace the new shops, roads, pristine sidewalks with perspective accurate views, video and using 3D sound headphones become deeply embedded in a past, many pasts – what does this mean for documentary producers? So going beyond helpful ‘guide apps’ such as the American Natural History Museum app covered by Read Write Web here are a few other key examples around the world of these early days as we place factual story around us, for generations to build on and explore our important and not so important pasts as we move through the present. 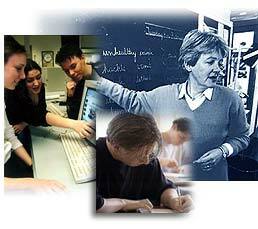 Non-exhaustive examples that show an evolving continuum from photos through video through role play to fully immersive education. Creating a historical record of your locale using this method is really the first step for many, although still tricky, mapping images in a perspectively correct way to modern buildings and places allows an immediate connection for the user to ‘change’, how the world around them is connected to the past. Seeing people walking past a brand new (back then) building a hundred years ago directly in front of you, and imagining what they were thinking, what there lives were like, the stories they left behind is a humbling experience. HistoryPin is a great social example of how we as a global community can leave a ‘place based’ legacy of our stories for generations to come. I liken this Webby Award winner to leaving residual ghostly stories, thoughts, images to be discovered perhaps 300 years from now by a child growing up where we once stood or someone looking for material for an historical drama or an historian filling in gaps in cultural research. I becomes part of our responsibility and vanity to do this perhaps? The famous Natural History Museum in London wanted to take ‘factual’ AR to the next step by incorporating over-layered moving, alpha video and contacted BBC R&D (old cohorts of mine!) to see if TV style ‘Walking with Dinosaur’ type graphics could be incoporated into the new David Attenborough Studio lecture theatre – specifically for an experiential film about evolution. Various partners, complex camera tracking and bespoke handheld displays later the results give an insight into what will be on every smartphone in a few years – not in a controlled indoor environment like this, but all around and anywhere there is a good GPS/WiFi/3G mix! 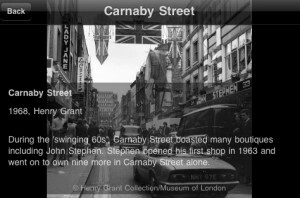 Streetmuseum gives you a unique perspective of old and new London whether you’re discovering the capital for the first time or revisiting favourite haunts. Hundreds of images from the Museum of London’s extensive collections showcase both everyday and momentous occasions in London’s history, from the Great Fire of 1666 to the swinging sixties. HISTORY™ has joined forces with the Museum of London to develop a free new app for your iPhone or iPad. 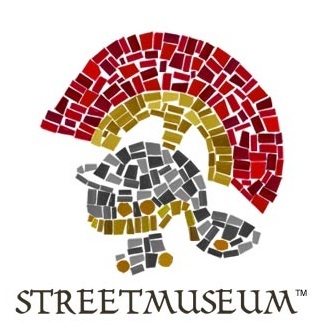 Streetmuseum Londinium gives you the opportunity to see Roman London as it might have been centuries ago. Key Roman sites in London will be brought to life through augmented reality video which will overlay scenes of Roman London onto the view today as seen through your camera. Have a go at digitally excavating Roman artefacts by blowing or using your finger to dig and reveal objects including a leather bikini, a foot-shaped lamp, and a hoard of gold coins. An ancient map helps you to explore the city and uncover what stands there now – did you know The Roman Temple of Mithras stood just moments away from where Bank Tube station is now situated? Or that the Amphitheatre – used for gladiatorial games – was located near St. Paul’s Cathedral? 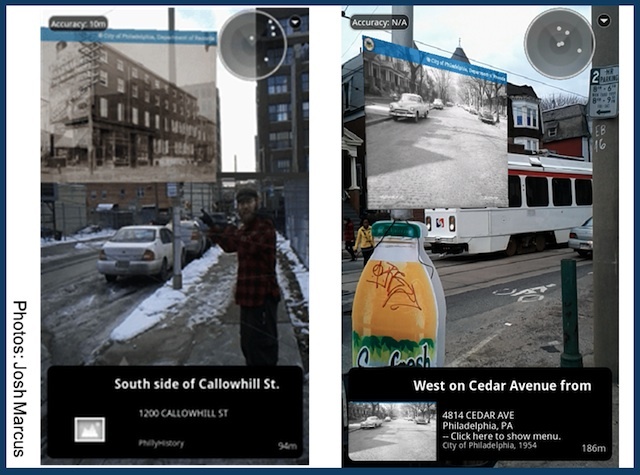 Related to the AR locatinima element of the previous example context of this post but I have been having lots of requests over the past year to help filmmakers segment their videos up into locative chunks and make them playable in location. I have also been presenting & blogging how this might look over the past two years and indeed am currently scripting two live ‘locatimima’ original films which really take into account a ‘voyeurs vs viewers’ journey as they take linear and non-linear routes physically through a story. So it was also great to see this “See a bit of the film where it was made” app go viral in the past few weeks, suggesting that a lot of people now get this for basic ‘film’ in situ. OK for documentary it is not the most experiential and apart from wandering to various locations, it could still be very passive. In fact there have been several audio based AR apps (that shall remain nameless) that do exactly that, you walk to a spot, listen to a bit of a story, then go to next spot – repeat until bored. The key with all of this is to, like any good multi platform, interactive property, make it personal resonant with a good dose of social! But as I said good to see they have awakened some global interest though! In contrast with the previous examples, putting you in the thick of the action and Seriously Gamifying the Situated Documentary (that is turning into a mouthful) we have a few offerings from ArisGames that give you roles and scenarios to play within. Being a journalist, a peace maker etc: in the riots in the US during the Vietnam War anyone – in the location those riots took place! Dow Day virtually places you in 1967, on the campus of the University of Wisconsin – Madison, when the students began a protest against the Dow chemical corporation for making napalm for the war. You take the role of a news reporter and investigate the different interests and perspectives of students, police and Dow employees. Augmented reality immersive interfaces possess the potential to improve student learning and move students beyond predetermined textbook notions of history. 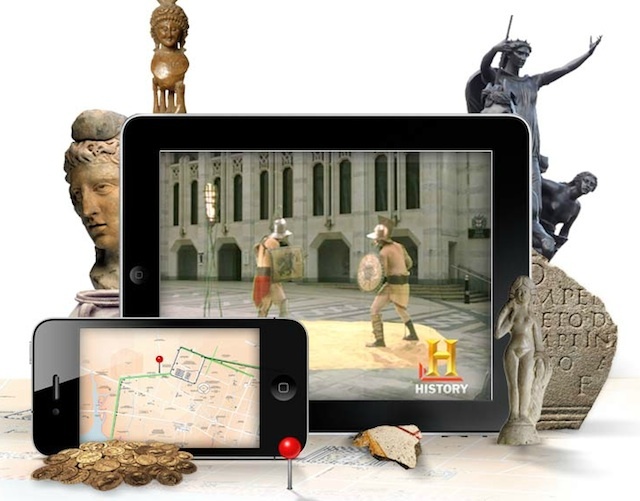 History is something students should do, not something they should consume and augmented reality games and simulations can scaffold student learning to the historical inquiry process. There is a great deal of interest in these ‘enhanced’ school field trips as it both appeals to students as an experience but also has true (Purposeful ‘Edgar Dale’ Play – slide 3) and Pennsylvania teachers have developed a Civil War Augmented Reality Project that uses Layar to map history on notable sites such as the Battle of Franklin which are about to be enhanced with true AR elements. GHSI – Georgia Historical Scene Investigation (an 8th grade project for Georgia history students) combines elements of all of the above examples with a fun ‘TV-style amazing race format’, social media and game. It is not clear if this has run yet but the video has all the right intentions! This 2MB PDF explains a little background and Camaal Moten, it’s designer, has a great blog on Augmented Reality Education here. To finish I wonder how much of the above will become commonplace so that people arriving in a new location may be tempted to take part in a much more involved Transmedia Situated Augmented Reality Documentary? I think we are already seeing the morphing of the tour guide book into an electronic form for many – the heavy Lonely Planet guide is now a downloadable app. From there we can browse that far and distant world before we go, perhaps taking mini remote tours so we have insights, understand culture and stories. Tour Wrist covered here by FastCoDesign allows you to stand in ANY location and view a completely new world through tablets – and allows unlimited zoom too, you are virtually transported to that place. But once there the electronic guide starts to evolve. These basic tour offerings from the Fraunhofer Studios (the dARsein tour through the Architectural House of Olbrich and below that the historical tour of Berlin) pave the way for all of the above – locked into using AR enabled smart devices to guide you by the hand will mean all travellers (whether visitors to countries on the other side of the world, or those just walking to their local town) will be tempted to go that little bit deeper, to view the past, to immerse themselves in it, to become someone in that Situated Location Based Documentary.